Not one single minute watching World Cup but I kept up to date. With the World Cup ending last night and Spain being crowned the champions, I have a confession to make. I did not watch 1 single minute of the World Cup on either the TV or live in a stadium. I did not even attend one of the Fan Fests or Fan Walks. This might sound very unpatriotic but I can assure you I took an active interest in it and am very proud at the way that South Africa hosted the event and presented the country doing it. The main reason is that I do not own a TV and am just not into soccer that much to spend money in a restaurant or other venue watching it. Having said that, I have kept up with whatever was going on by mainly using social media like Twitter and Facebook. And I must say that following the soccer on Twitter was probably much better than on TV if I have to listen to the tweets. Heavy breathing commentators is just not my scene and totally missing Madiba by showing an advert – that is just not on. 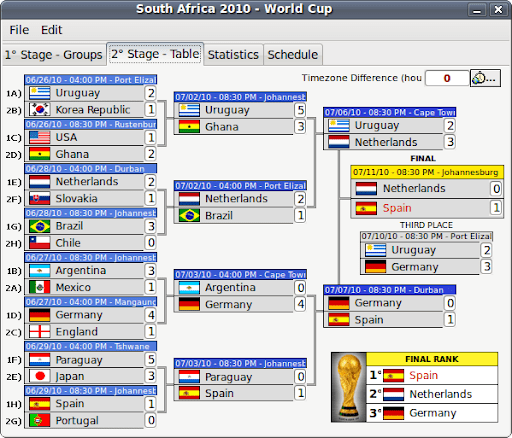 Also I had this great little app on my Linux workstation that got updated via the Internet, so I always knew the stand of the teams in the group stages or during the knockout rounds. This just goes to show, in this day and age one can be up to date and take part without TV and old way media by using new way media. And the cherry on the cake is that my debt levels is way less than lots of other people that went on a spending spree and blame it on the World Cup. ← Previous Previous post: The most perfect day in Cape Town.